ADRENALIN PROUDLY PRESENT COMPACT DISK TWENTY FIVE A. 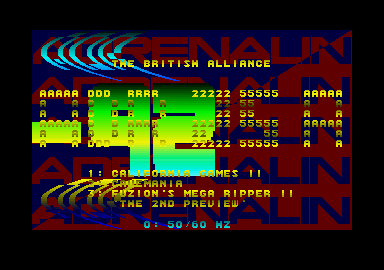 RELEASE DATE 1-10-92 COPY THIS DISK 80 TRACKS 10 SECTORS 2 SIDES ON THIS DISK YOU WILL FIND CALIFORNIA GAMES II WHICH WAS CRACKED BY THE JOKER AND PACKED BY ME 'MOOKIE' (WHEN ASKED TO INSERT DISK B, INSERT ADR 25 B), CAVEMANIA WHICH WAS CRACKED AND PACKED BY OUR VERY OWN MAXIMUM VELOCITY AND FUZION'S MEGA RIPPER II 'THE 2ND PREVIEW' WHICH WAS PACKED ONCE AGAIN BY ME 'MOOKIE'. I GET THE FEELING THAT PURE ENERGY HAVE UPSET MAXIMUM VELOCITY, M.V. HAS NOW GONE AND CODED A SCROLLER ON HIS LOADER TO CAVEMANIA. CAN YOU GUESS WHY WE DON'T LET HIM PRESENT MENU'S ?? WELL, ALTHOUGH M.V. MAY BE UPSET WITH PURE ENERGY, THE REST OF US HAVE HAD NO TROUBLE WITH THEM RECENTLY. THEY DO THEIR THING AND WE DO OURS. I HAVEN'T SEEN A PURE ENERGY MENU SINCE SNAZ SENT ME THEIR CD 28. CREDITS FOR THIS DISK ARE AS FOLLOWS.... CODING BY SPACEMAN SPIFF, GRAFIX BY BIOFEEDBACK, MUSIC BY MAD MAX FROM LETHAL XCESS AND DISKS COMPILED BY MOOKIE. GREETINGS TO THE REST OF THE BRITISH ALLIANCE WHO ARE... C.I.D., INSANITY, SPECIAL FX (ESP. JAM), SYNCRO SYSTEMS, THE LEMMINGS AND WILD! (ESP. SNAZ) GREETINGS ALSO TO THE FOLLOWING... ANIMAL MINE, ADMIRABLES, ANTHRAX, BREAKPOINT SOFTWARE, CHAOS (ESP. BEN. THE BEST MIDI MAZE PARTNER YOU COULD WISH FOR. ), CYNIX (ESP. QUATTRO, SEND SOME NEW STUFF SOON), CRACKDOWN (ESP. INSPIRAL), CHRIS H (YORK), CHRIS H (MID GLAM), CHRIS H (STAFFS), D-BUG, DIGI TALLIS, ELITE (ESP. SIDEWINDER OF HOTLINE, SEND SOME STUFF SOON), THE EDGE, (E) TRIPPER, FUZION, KGB, MAD VISION, MUG U.K., MICRO MANIAC, OUT OF ORDER (ESP. SONIC AND THE ASSASSIN), PERSISTENCE OF VISION (ESP. MAC SYS DATA AND BORIS), POMPEY PIRATES, POWA, PULSION, PURE ENERGY, REPLICANTS, RIPPED OFF (ESP. STICK AND BILBO), RED LICHTIE, SYNDICATE, SUPERIOR, SAFARI (ESP. PANTHER AND RHINO), SCANZ, TIM, AND UNTOUCHABLES (ESP. MAT). LET'S WRAP!! !